In our Bon Appetit Wednesday! post for Rosh Hashanah this year we told you about the ways in which recipes and traditions for the Jewish New Year have been influenced heavily by the cultures in which they are celebrated. A Jewish family celebrating in France may eat an entirely different meal than those celebrating in India. One of the influences we discussed comes from the Sephardic foods enjoyed by Jews residing in North Africa. Today, there are Jews all over the world whose religious feasts, including those at Hanukkah feature the flavors of places like Morocco rather than more typical dishes such as latkes. Many of these families identify with both Sephardic (Spanish and North African Jews) and Ashkenazic (primarily Eastern European Jews) Jewish traditions. Their foods and traditions are a beautiful mix of cultures. Click here to read more about Jewish ethnic diversity. This Hanukkah, spice up your table with a new dish and add sfenj to your celebration. Read Rosh Hashanah Around the World: Ancient Influences, Modern Recipes to learn more about how the ancient past has shaped modern Jewish tradition all over the globe. Dissolve the yeast in 1/4 cup of the warm water and set aside. Mix the flour, salt and rest of the warm water in a large bowl. Add the water and yeast mixture, and stir vigorously with your hand or a spoon until smooth. The dough should be too sticky to knead or shape, almost like a batter. Cover the bowl, and leave the dough to rise for two to four hours, until double or triple in bulk. In a wide pot, heat an inch or more of vegetable oil until hot. Dip your hands in water, and pull off a piece of dough about the size of a small plum. Use your fingers to make a hole in the ball of dough, stretch the hole wide to make a ring, and place the dough in the hot oil. Repeat with the remaining dough, wetting your hands as necessary to keep the dough from sticking as you work with it. Don’t overcrowd the rings in the hot oil. 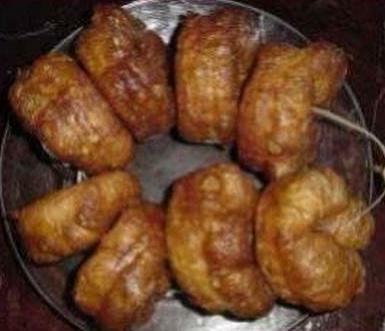 Fry the sfenj until golden brown, turning once or twice (two to four minutes each side). Remove the cooked sfenj to a plate lined with paper towels to drain. Serve hot with powdered sugar or honey. Serve the sfenj hot. If desired, dip the sfenj in sugar to sweeten them. Cohen, A. (n.d.). Hanukkah’s rich but lesser-known food traditions are rooted in history. Retrieved December 5, 2014. This entry was posted in Blog, Bon Appetit Wednesday, Culinary, Culture and tagged ancient history, ancient recipes, AntiquityNOW, Bon Appetit Wednesday, Hanukkah, moroccan doughnuts, Sephardic, sfenj. Bookmark the permalink.